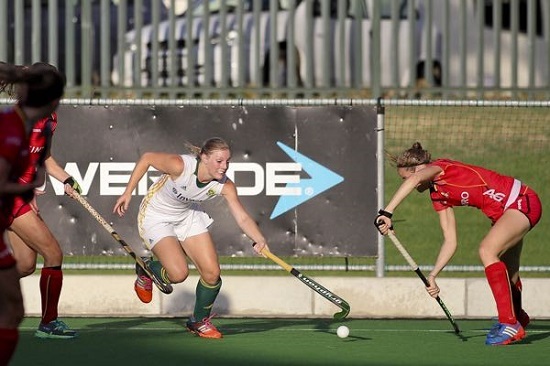 The Investec South African Hockey Women recently completed the Summer Series with two series of high quality hockey. They faced off with Belgium in a four game series against and Chile in a six game series. 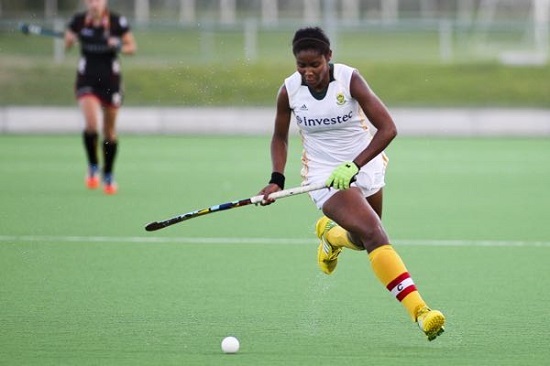 With Pietie Coetzee now retired and Marsha Cox unavailable for the series, the SA ladies were able to select a few new caps for the festival of hockey in Cape Town, but also selected a largely experienced squad with the likes of Shelley Russell, Marcelle Manson and Sulette Damons all in the squad. Here is a review of the series, with a large thank you to Jon Cook for the details to fill in the blanks! The Investec South Africa side started off with a cracking match against Belgium. Belgium led early through a flawless penalty corner execution by De Groof. Both defenses did an outstanding job to repel the opposition and Sanani Mangisa was fantastic in denying Belgium a second. After more good defense by skipper Lisa Deetlifs, Marcelle Manson, Nicole Walveren and Nicolene Terblanche, lethal striker Lilian du Plessis popped up to finish a brilliant run by Sulette Damons. Despite having the momentum, SA were unable to score a winner and, in truth, were thankful to a wonderful triple save by Anelle van Deventer to deny Belgium the win. 1-1 the final score. In the second test against Belgium, South Africa had to fight back from an early 2-0 deficit, both goals through De Groof. The South Africans fought back when Damons and Russell combined well to set up Dirkie Chamberlain, who finished with style. But the 2 goal lead was restored by Belgium through De Groof’s hat-trick strike. 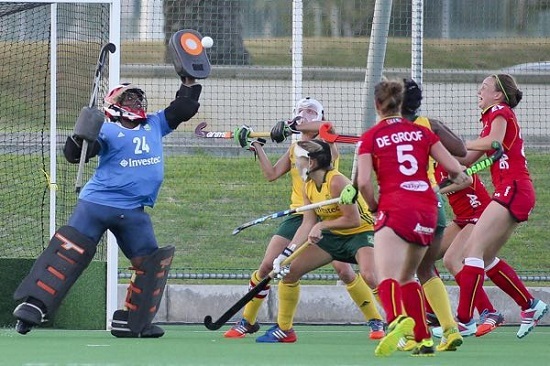 South Africa refused to taste defeat and in a spirit of determination fought back through Nicolene Terblanche and a stunning backhand strike from Lilian du Plessis pulled it square. Final score 3-3. The third test will be remember fondly by Sanani Mangisa who collected her 100th cap for South Africa. Sanani is a great servant of SA Hockey and we salute her from All Things Jabu. Belgium finally had a different goal scorer when Manon Simons finished a penalty corner variation to give the Europeans the lead. The fighting spirit already demonstrated by the South Africans in the first two tests was imminent again as Dirkie Chamberlain scored twice to give SA a half-time lead. On the stroke of the end of the third chukka, Candice Manuel got a well deserved goal after great work from today’s skipper Jade Mayne. 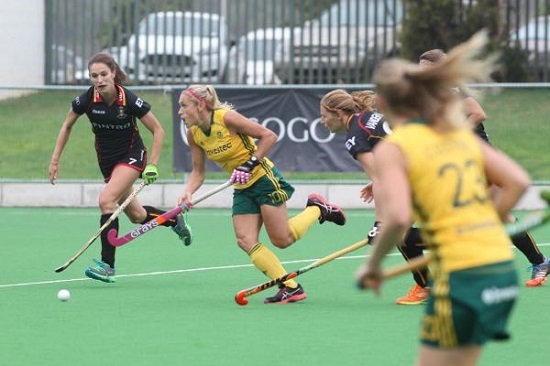 Belgium pulled a controversial goal back through Boon, but SA would hold on for a series lead. Final Score 3-2 to South Africa. For the first time in the series, South Africa scored first and seemed to be galloping away with the match after Dirkie Chamberlain finished off Lisa Deetlefs penalty corner and captain for the day Sullette Damons finishing coolly. SA maintained this lead to half-time and looked certain to take an unassailable lead in the six match series. Weyns pulled one back in a second half that was completely dominated by the Belgians before De Groof scored her fifth of the series to level the series. With just three minutes left, Damons effected a great block from the PC, but De Groof slapped home the rebound to win the game for the Europeans and level the series. Final Score 3-2 to Belgium. SA forward Bernie Coston on attack against Belgium during the first Test at Hartlevale in Cape Town Friday.